Originally developed at the National Theatre Studio, ‘Frozen’ sees a cast of Deaf and hearing actors bring fingersmiths’ visual and physical theatre style to the stage, in the first major production of the play in 10 years. Right from the offset, you know that Frozen is going to be a hard-hitting psychological drama. As the lights go up you are confronted by a compact, split-level set, all harsh white angles everywhere that set you on edge. You don’t feel in harmony with what you’re seeing; no flowers or homely living-room paraphernalia to make you feel like a cup of tea. Thus the scene is set for a contemporary piece of theatre that keeps your nerves fraying throughout. Frozen explores issues arising from the abduction and murder of a 10-year-old girl, Rhona, and how the crime ‘freezes’ the three main characters – Ralph, the girl’s killer, Nancy, her mother, and Agnetha, a criminal psychologist – into states of fraught emotional paralysis from which they are unable to escape. A vivid, gut-wrenching and complex drama, Frozen also highlights the challenges in determining whether a crime should be treated as a sin or a symptom of mental health issues (Ralph is himself a victim of paternal child abuse). 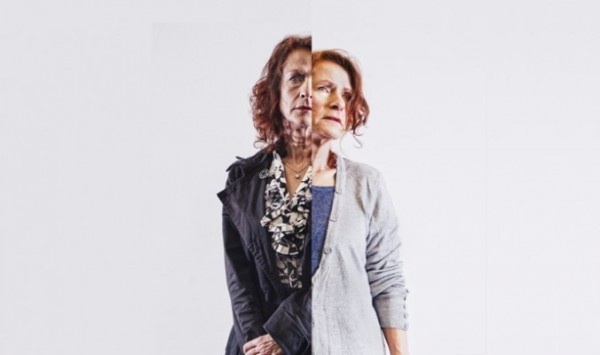 A large chunk of the play is dedicated to monologues, enabling insight into the characters’ changing thought processes as they struggle to make peace with their individual pain. Eventually the monologues draw the characters together in raw symbiosis via one-to-one meetings. The final thaw-out is provided when Nancy visits Ralph in prison years later, with three simple-yet-hard words – ‘I forgive you’ – unleashing an extraordinary change in the serial killer. In the hands of Fingersmiths, Frozen went smoothly from a three-hander to a bilingual ensemble of six without losing its edge, due to a high-calibre cast that kept us gripped all the way through. Detailing exactly what each actor excelled at is impossible given the talent involved, but Mike Hugo and Neil Fox-Roberts (both of whom played Ralph) and Hazel Maycock, as the speaking Nancy to Jean St Clair’s BSL counterpart, were flawless. In bilingual Deaf theatre, the idea of having characters in duplicate – one signing, one speaking – is not new. I liked the way the pairs interacted with each other symbolising an internal dialogue, but the decision to move away from mirroring each other as well didn’t always quite work. By entering the stage independently of each other and on different floors at the beginning, the two tightly-suited Agnethas (Sophie Stone and Deepa Shastri), highlighted the sense of each being alone in separate homes. This left me slightly confused as to whether they were playing the same character, or just happened to have synchronised thoughts and actions as different people. The two Ralphs were more successful with the BSL-using aspect (Fox-Roberts) pointing nonchalantly at the tattoos of his speaking counterpart (Hugo) while the latter recalled their history. I welcomed the approach as a refreshing and bold experiment in theatrical dynamics.